Comment on Quirky Girl Shopping Adventure; Fashion Jewelry Vs. Handmade Jewelry by Ruby H.
I spent my afternoon at a couple of big name department stores viewing fashion jewelry. At the beginning of a season I am always interested in finding out what the buyers for the big retailers sense are the new trends and what price point they are able to deliver. It was a beautiful day; the sun was shining through some big fluffy clouds that appeared to be warning of a little rain. I didn’t mind because it was much cooler which allowed me to have the car windows down and feel the breeze across my cheeks. I have been closed up in air conditioning for some time so this was a small treat! I arrived early, there was plenty of parking but many ladies were rushing about, having been tantalized with sale ads. There were signs everywhere in the first big box department store I visited Jewelry 30% off – they touted. We all know how much we love jewelry, and this day was no different. There were ladies all around the jewelry counter. They were searching through necklaces, earrings and bracelets, some asking friends their opinions, others holding pieces up to the new garments they had planned to purchase. I began at one end of the department and worked my way slowly around the counter and through each display. 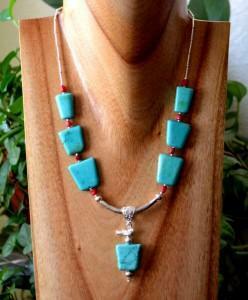 It was a wonderful array of color and I was surprised to see how much turquoise and coral color there was in the fall selection. Big, bold pieces appear to be all the rage, but there was also a good selection of smaller pieces. If someone were to view you from across the room in one of these department store pieces they may find it interesting, but as they moved closer to you, the jewelry would just scream “cheap” to them. This would be a shame, because this “cheap” looking jewelry would still require a small investment. This is a lesson; it is not how much you pay for an item that determines its value. I continued on and visited the second department store, this one considered even higher on the department store scale. Still, the jewelry that I found was similar and most of it had been made in China. There was no workmanship involved, the chains were poorly made, the clasps were stiff and of poor quality, and they contained plastic stones. I treated myself to lunch and thought about what I had seen that day. I started feeling good about the quality of the products that I design and realized what value I was bringing to my loyal customers. Everyone likes to feel that they are making a difference in some small way, and I began to feel good knowing that I can help women to feel confident when they wear my handmade jewelry. I wondered on the drive home how to share with women who might not be aware, what the real difference is when they purchase a U.S. handmade necklace versus one they may buy on a whim in a department store. I believe the following reasons are important. 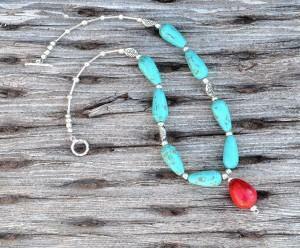 1) Buying handmade jewelry supports a small business. 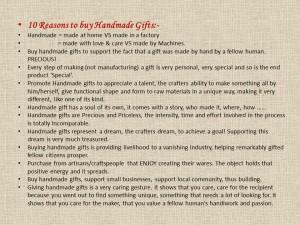 6) Buying handmade jewelry supports an artist. 7) Need 101 more reasons? I hope this post gives you food for thought the next time you go shopping for women’s fashion accessories. I would love to hear your thoughts and comments.